Starman/Roadster (2018-017A, 43205) is a Falcon 9 2nd stage with a red sports car attached, in a heliocentric orbit in deep space. It was tracked by telescopes for several weeks at least after launch and boost from LEO to it's orbit around the Sun. 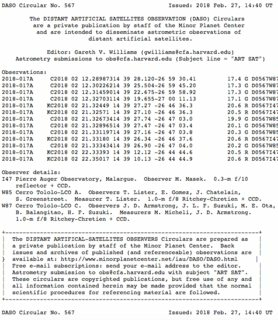 You can see one of those telescope images of Roadster in deep space in the question Where might astrometric observations of the Roadster spacecraft be catalogued?. Question: When was the last time that Roadster was seen, before it became to dim to observe? Don't forget to include a verifiable source for the date! @uhoh's answers are correct in that we at LCO were the last to observe the Tesla Roadster. 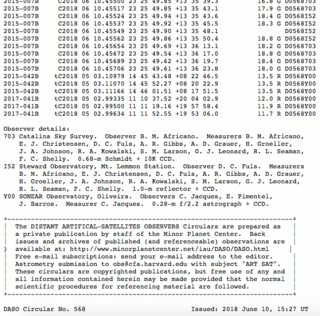 For some reason, a Distant Artificial Satellites Observation (DASO) circular was not issued in the March 2018 lunation with our data from MPC site code K93 or with the data from the ESA Optical Ground Station in Tenerife (J04) but the data at Bill Gray's Project Pluto site (pseudo MPEC link) are correct as he was CC'd on the reported observations. 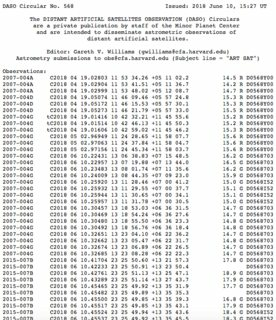 I have contacted the MPC and the "missing" data will get published in a DASO the next time there are enough observations of other things to issue one. 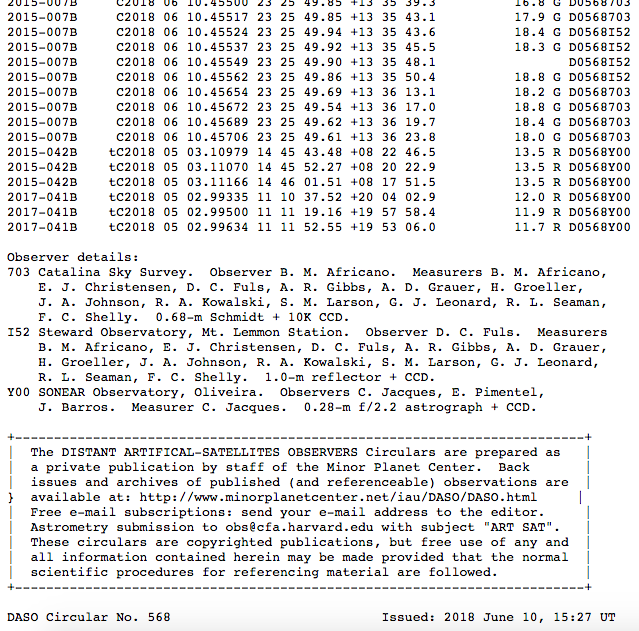 The observations are in the old standard MPC1992 observation format so the (decimal) date of the middle of the stack of CCD images (hence the KC) is columns 16-32 which translates to 2018-03-19 03:22:33 UTC. 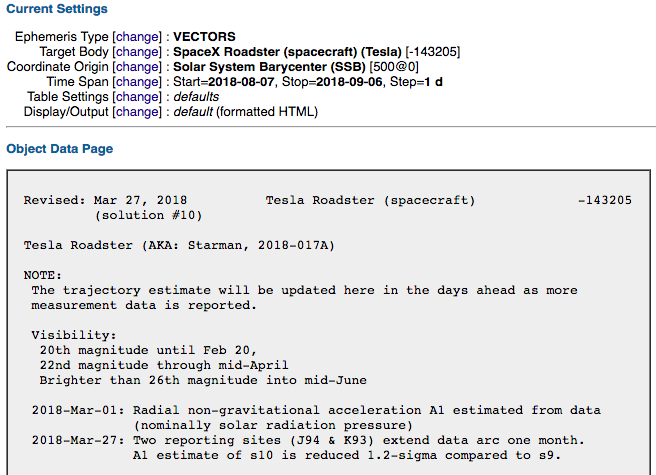 JPL computes orbits based on the data reported to the Minor Planet Center so the fact there isn't a Solution #11 means that no new data and observations of the Tesla Roadster have been reported. It was at the limits of what we could do with our 1-meter telescopes at the time and it's doubtful anyone would have pointed bigger glass at what was in the end, a publicity stunt. 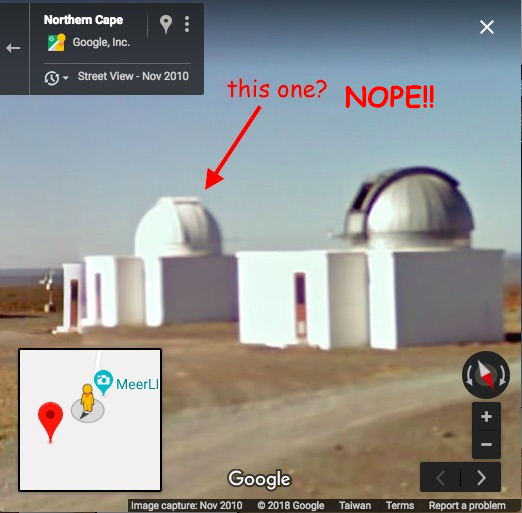 The telescope with the MPC site code K93 is the southern-most of the three 1-m telescopes LCO installed at the SAAO in early 2013; they are shown in this captured Google Street View from Jan 2017 (K93/Dome C is the central telescope in that view) but not in the earlier one above (since that was before our telescopes showed up). As commented above, in this image from the south end of the plateau looking North to the SALT telescope (center of the picture) the LCO 1m telescopes are the white domes at the front, left of center. We've added telescopes and a spectrograph (in a shipping container) since that picture and the Street View images were taken. 2018-Mar-27: Two reporting sites (J94 & K93) extend data arc one month. That is the last update that is included on the site, and thus seems likely to be the last update. 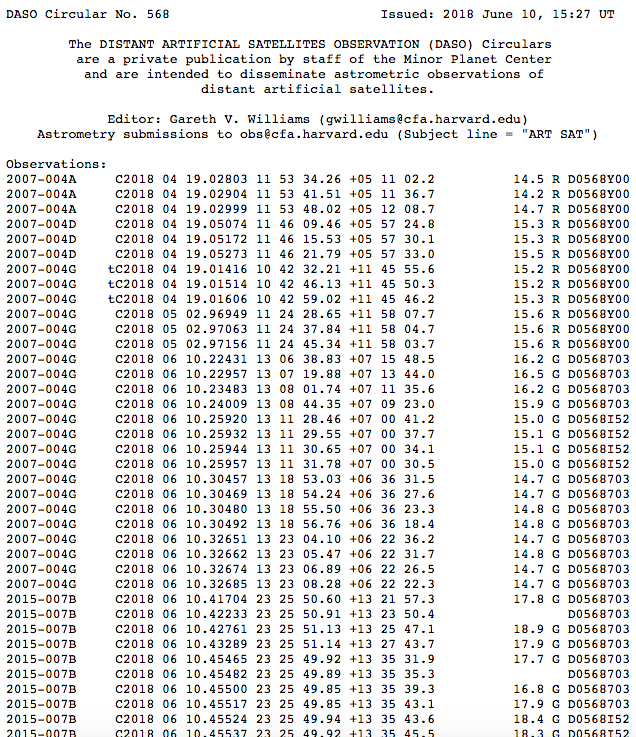 Looking at the two mentioned observatories, neither of them has a public log of when they actually recorded the observation, but from the context, specifically "extend data arc one month", I believe it was within a few days of March 27. Last observation that I can find documented is 22-Feb-2018. 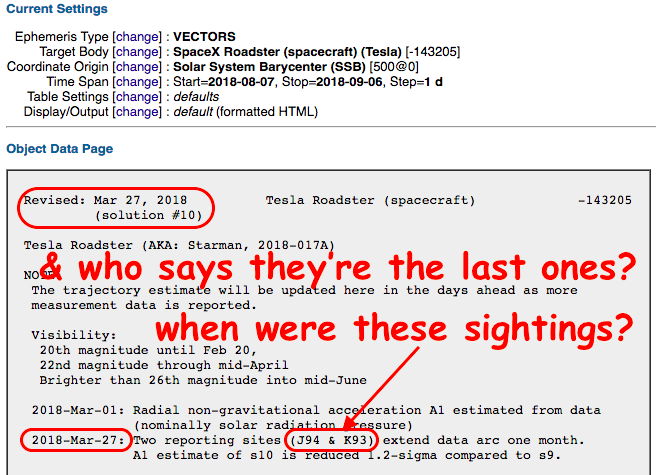 While the other answer shows displays the date of an orbit solution, and in comments tries to link that to an estimated observation date, without any explanation of that, nor why it should be considered the last time Roadster was seen, at least my answer is sourced, which was stipulated in the original question for precisely this reason. Last observation that I can find mentioned but haven't found any documentation of is 19-Mar-2018. 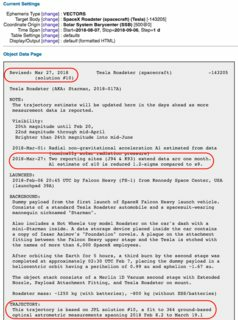 So there should be a documented sighting around 2AM 19-Mar-2018 UTC reported somewhere! That doesn't mean it's the last, any observation after 27-Mar-2018 would not be documented in Solution #10, so this is not a good source for the answer. The dimming rate is slow enough that further observations are possible, just less likely. The last documented observation of Roadster was made in Elon Musk's country of origin South Africa by "Observers T. Lister, J. Chatelain, S. Greenstreet, E. Gomez." and it's position was determined by "Measurer T. Lister." using a "1.0-m f/8 Ritchey-Chrétien + CCD." 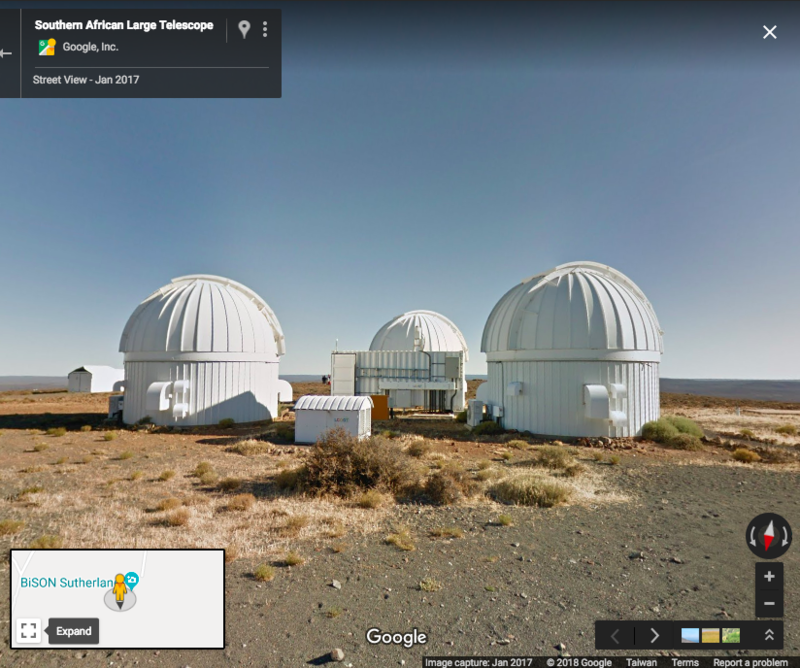 which is one of the Las Cumbres Observatory's telescopes located at the South African Astronomical Observatory at Sutherland (SAOO/Sutherland). 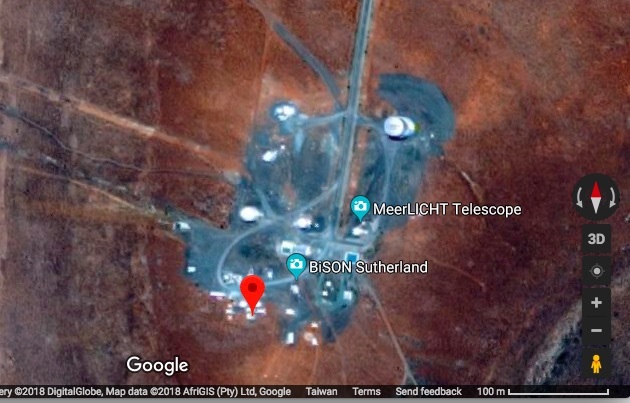 (K93) Sutherland-LCOGT C (S32.380670 E20.810110) South Africa. Observers T. Lister, J. Chatelain, S. Greenstreet, E. Gomez. Measurer T. Lister. 1.0-m f/8 Ritchey-Chrétien + CCD. which is about 2018-Mar-19 03:23 UTif I understand correctly. 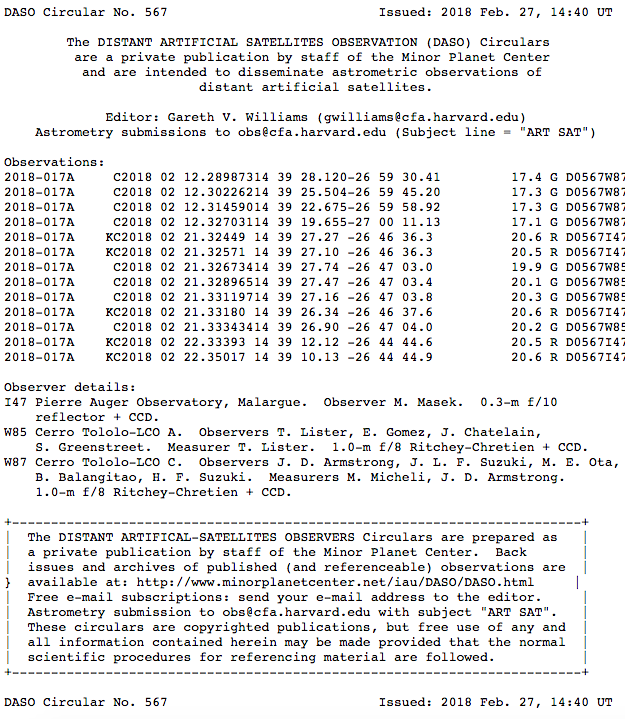 Thanks to Senior Analyst Jon Giorgini of NASA/JPL's Solar System Dynamics Group for assistance tracking this down! Not the answer you're looking for? Browse other questions tagged deep-space tesla-roadster observation or ask your own question. 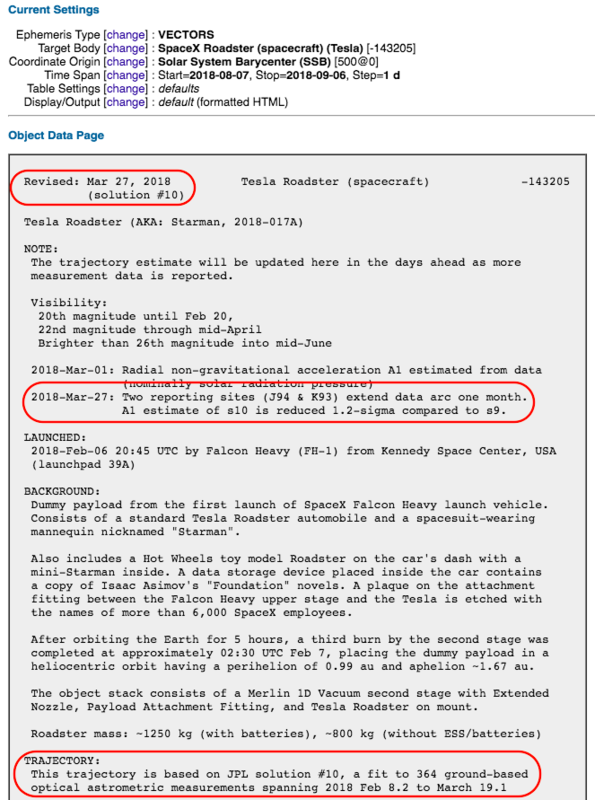 Was Roadster (Starman) seen in Earth orbit, before the long burn to deep space? Is Starman/Roadster in any danger in the asteroid belt? Why did Roadster (Starman) look fuzzy before the long burn to deep space started?